by R. G. Van Treuren Includes the Thesis of Dr. Addison Bain, PhD. C. E. Rosendahl wryly observed, “Airplane accidents are statistics, but airship accidents are disasters.” Yet no aeronautic incident has been so universally misrepresented as that of the 13 passengers who jumped to their deaths before the German dirigible Hindenburg landed, the only ’guests’ lost by DELAG in worldwide operations 1908-1940. Minutes after recording “Oh, the humanity!” radio reporter Herb Morrison lamented “I hope… you don’t think it was as bad as I made it sound there at first” when he saw that the passengers who had not jumped were walking away from the wreck. 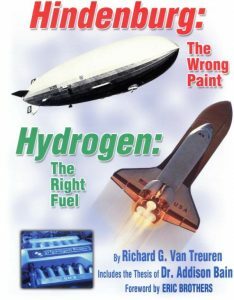 The real disaster of the Hindenburg is the common misconception, never supported by evidence, that the hydrogen lifting gas could have played a role in igniting the covering seen burning brightly in the newsreel footage, or generating the intense heat reported by survivors. The breakthrough research of Dr. Addison Bain demonstrated in the laboratory what actually set the Zeppelin’s cover alight. 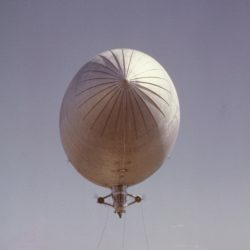 Additionally, understanding the record-setting history of hydrogen-borne airships paves the way for modern technology to build the first airships that actually have control of their aerostatic condition—through the use of environmentally friendly, safe, OPEC-resistant, abundant and inexpensive hydrogen fuel.